Nerf is gearing up for their new Lazer Tag system, to be released later this year. The new system combines the use of technology with classic Nerf for enhanced augmented reality gameplay. It’s designed to be used with an iPhone or iPod Touch, but you can also play using the blaster’s classic multi-player mode. After looking over the press release I am pretty intrigued by its stats. According to Nerf, the Lazer Tag system has a virtual firing range of over 250 feet. After you download the free app for your iPod or iPhone device, you just plug it in and go. The on-screen ‘Heads-up’ display allows players to see the laser and keep track of their gear and remaining power supply. When in solo mode, the blasters will provide a view of the ‘augmented reality’ targets and enemies in the area. The multi-player mode is impressive too.The game can be played by up to 24 people at the same time! 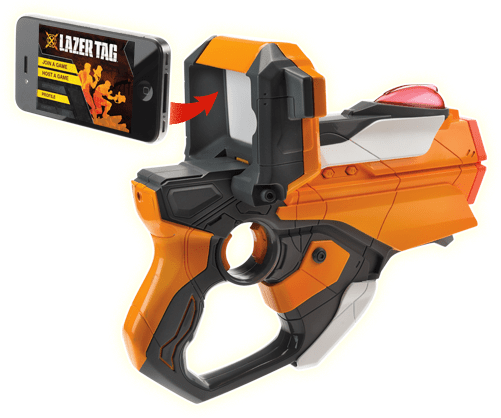 The Lazer Tag system is recommended for anyone ages 8 and up and will retail for $69.99 for two blasters and $39.99 for one blaster.